The following is a review of McClelland's Deep Hollow that I did on 02/21/2006. This lightly fragrant blend of rich, Red and Black Stoved Virginias is designed to transport you. Relax and enjoy the moment. 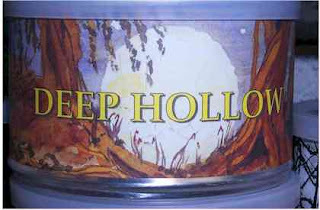 The name Deep Hollow comes from the works of JRR Tolkien: Deephallow (Deep Hollow): A village on the Shire's eastern border, built on the banks of the River Brandywine. Immediately across the river was Haysend, the southernmost point of Buckland, while just to the south of Deephallow, the River Shirebourn flowed into the Brandywine. Deep Hollow is a nice blend to turn to if you want something a little sweet. There is a faint hint of vanilla here and the Virginias mask it well, allowing the creamy vanilla to trickle through ever so slightly. Deep Hollow is a nice and decent smoke. However, I am on a quest to find a few good blends to stick with and DH just doesn't have enough interests for me to keep around...glad I tried it though. I prefer Frog Morton On The Town by same blender. Enjoy!